This group of Dutch supporters was actually the winners of the McDonalds competition on Holland. Their prize was to travel to SA and support Holland in their World Cup campaign. They did not know each other but have become friends on the trip. This photo was taken just before the Holland vs Cameroon game in Cape Town on the 24th June. 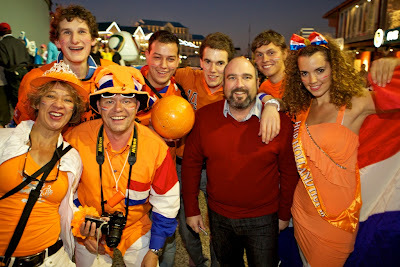 They were enjoying themselves in the Waterfront prior to the game, along with thousands of other Dutch supporters. Q. How long are you in SA for? Q. Is this your first visit to SA? Q. What do you think of SA? Q. How many games are you watching at the stadiums? Q. Are you travelling to other cities or staying in Cape Town? Q. Which is your favourite city? Q. Which is your favourite stadium? Q. Where are you staying in Cape Town? Q. What do you think of Cape Town? Q. What do you think of the V&A Waterfront? Q. What do you think of the vuvuzela? Q. Do you have a vuvuzela? Q. Would you come back to SA after the World Cup?